As guitar players, what are we all after? What do we struggle to describe, work to attain, but always know when we hear it? And what is all that gear out there for? The answer to all three of these questions is the same: great tone. With so much equipment available today to help in creating tone, how do we go about making it do what we want? Let’s take a look at some simple and effective ways to get killer tone with overdrive and distortion. The first question is which should you use: an overdrive or distortion? The answer isn’t quite that simple. Like many things in the tone-quest world, there aren’t too many fixed rules here. The real answer is: it depends. Maybe an overdrive is what works for you; maybe it’s a distortion. So the next question is: What’s the difference between an overdrive and distortion? Learn how to chain your guitar effects pedals. Generally, an overdrive is designed to work and sound like an old tube amp turned up loud. A good overdrive can produce the same overtones and harmonics that an overdriven tube amp produces, hence the name Overdrive. 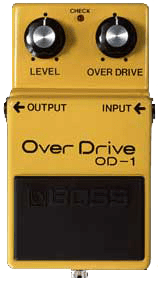 BOSS started the overdrive revolution with the legendary and very collectible OD-1. A distortion usually goes beyond the amount of gain and harmonic crunching typical of an overdrive. They tend to get more distorted, are usually (but not always) louder than typical overdrives, and often have multiple gain stages for abnormal amounts of sustain. The BOSS MT-2, probably the best selling distortion pedal ever, is a good example of a distortion pedal with those features. Now that we know what they are, let’s look at making them do what we want: getting great tone. First, let’s start with overdrive and after you’re finished reading that check out the distortion article. Learn how to get great tone from an OVERDRIVE stompbox. Learn how to get great tone from a DISTORTION stompbox. So there you have it, what is your preference? What do you use to get your tone? Leave us your comments. I know a lot of country guys that love the metal zone pedal..They generally turn the gain off and the level up..Apparently it makes a really good sound when used as a boost. Gosto do meu HM-3 (Hyper Metal)…tem o som perfeito. Pena que no Brasil o preço dos pedais da Boss são absurdamente caros. Queria ter mais pedais Boss e uma Gibson Les Paul… Tenho apenas o Hm-3 da Boss. It would have been a much better article if you explained that OD’s push the signal from the guitar to the amp at a higher amplification, hence pushing the tubes into breakup. A distiortion alters the signal before pushing that signal hard into the amp. I like to run a distortion pedal first, then run that into a tube drive. It blends together to create a better tone. I doubt that the Boss MT-2 is the ”best selling distortion pedal ever”. I think the ProCo Rat or the Big Muff deserves that title. To tell you the truth…i never heard of those two… proco rat? what?, big muff w? never heard of them, you wouldn’t happen to be from the Americas would you? You’re no musician if you haven’t heard of either. Look them up. Quite a useful knowledge. Thanks!